Dzisiaj wyjątkowo po angielsku. Obie książki, o których piszę mam po angielsku, poza uważam, że moi anglojęzyczni znajomi powini je przeczytać więc dziś trochę dla nich. Książka “I can’t wait” jest przetłumaczona na język polski – “A ja czekam” – gorąco polecam! A poza tym, piszę na poziomie gimnazjalisty, więc więc większość z was zrozumie! 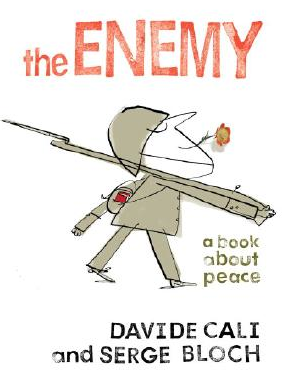 I don’t remember who recommended “The Enemy – A Book About Peace” to me, but after researching the authors of that book, I found an amazing book by the same two authors – “I Can’t Wait”. The Swiss-born, French-speaking author of award winning children’s books, Davide Cali has put in a very few words the sense and the meaning of life, the past and the future, the happiness and the sadness of human existence. “I Can’t Wait” is an innovative, intriguing and wonderful book for all readers and all thinkers. In short this is a book to read, to think about and to talk with your kids about. It is also a book to look at and look and look…Serge Bloch – an outstanding illustrator did an incredible job adding life and color to Cali’s words. The black and white drawings are simple and clear but one thing that Bloch added to his drawings – a red thread – made the drawings meaningful and telling. In one picture, the red thread is a bow in a mother’s hair, in another, it is an umbilical cord, a telephone line or a good bye wave. It symbolizes a bond between two people, happiness, anger and death. One of the best books I have ever seen! You can enjoy the same Bloch-Cali duo, the same simplicity, the same multilevel approach, the same depth in their other book “The Enemy”. It is, as promised by the authors, a book about peace. It shows two soldiers standing, sleeping, being hungry, angry and sad. It shows two soldiers hating each other and plotting each other’s death until they get to know each other’s foxholes. They both have families, loved ones waiting for them, they both hate the war and want it to be over. Every military child should read this book but not only…every child should read this book and every parent should read this book. It is not only about real war, it is about the hatred, antagonism and hostility that we see and experience in civilian life. And maybe it is just enough to check out the perspective from the other person’s foxhole.